1/08: On Jan. 26, the Surface Transportation Board denied two requests from Conrail to waive certain requirements they would have had to face related to selling the Embankment. 3/08: As a result of community protest, the developer has proposed a new plan that would leave 75 percent of the 5.6-acre, six-block Embankment structure as open space. The remaining 25 percent would be demolished to make way for a housing tower. 8/09: The Jersey City Zoning Board has affirmed May’s 6-0 vote of the Jersey City Historic Preservation Commission to deny the developer’s application for hardship exemptions that, if granted, would’ve allowed demolition of the Embankment. 3/2010: The Embankment Preservation Coalition was one of five advocacy groups involved in a March 25 summit, hosted by PNJ, focusing on reinvigorating advocacy for previously-listed “10 Most Endangered” places. 6/10: On June 23, the Jersey City Municipal Council voted to introduce an ordinance authorizing the City to bond for $7.7 million to acquire the Harsimus Branch Embankment property. The funds would be used to purchase eight parcels running along Sixth Street from Marin to Newark and beyond Newark past the New Jersey Turnpike, including the six elevated Embankment blocks and two grade-level parcels. The bonds would be paid back in large part through grants already awarded or anticipated and through pledges. The Coalition was instrumental in pursuing these funding sources for the City. While this first reading is a positive step, the ordinance must go through a second reading, and a supermajority of six votes is needed for it to pass. A vote is expected at the July 14 Council meeting. 7/10: The Jersey City Council has approved the $7.7 million bond to purchase the Harsimus Stem Embankment. While the Embankment is not for sale at this time, the City Council has confirmed their interest in purchasing it in the hopes that the developer will respond with an interest in selling. 8/10: The Jersey City Zoning Board of Adjustment has announced a hearing on demolition permits for the Harsimus Stem Embankment. These same permits were denied by both the Jersey City HPC and Zoning Board of Adjustment last year (see updates above), however, the developer appealed and the Superior Court remanded the case to the Zoning Board for an entirely new hearing. Members of the public will be able to question witnesses and testify. 10/2011: The Jersey City Zoning Board of Adjustment has voted unanimously to DENY applications by six Limited Liability Companies and their partner, Conrail, to demolish the Harsimus Branch Embankment. In hearings that stretched over more than a year, the ZBA heard numerous expert witnesses and reviewed thousands of document pages to reach its decision. Among reasons for the denial, several commissioners cited the importance to the city of the Embankment, as expressed by citizens during the public comment portion of the hearings. In the late 19th and early 20th centuries, Jersey City was arguably the freight railroad capital of the eastern United States. The tracks of seven lines converged on the Harsimus yard on the Hudson River. 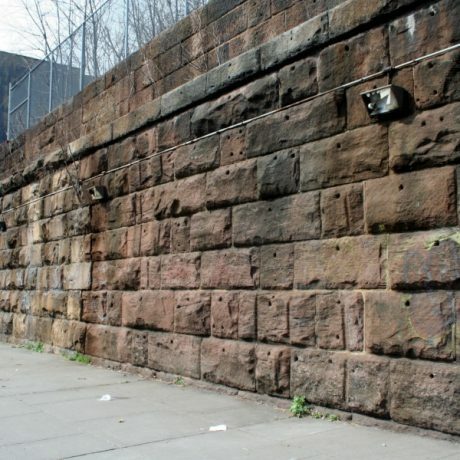 In response to concerns about grade crossing safety, the Pennsylvania Railroad built this massive sandstone and granite-block embankment (ca. 1901 -1905) to carry the lines through half a mile of downtown Jersey City. The Embankment continued to carry traffic destined for lighterage to New York City and beyond until mid-century, and shipments for industries on the New Jersey waterfront at least through the 1980s. The entire structure remains an important part of Jersey City’s downtown landscape. It is structurally sound, and with the exception of one section that has been altered, the masonry of the entire embankment retains remarkable integrity. Moreover, nature has been retaking the unused embankment floor and it now offers rare open space in this densely populated city. Conrail sold the Embankment property to a private developer in 2005 who is seeking now to build housing on the site. He is opposed by Jersey City, the Embankment Preservation Coalition (which has helped the city raise $5 million to acquire the property), and thousands of individuals and many organizations that support preservation. An alliance is petitioning the Surface Transportation Board to determine that Conrail’s sale to a developer was premature and that they failed to follow federal abandonment law, which would provide protections to the structure and an opportunity for the City to purchase it before the right-of-way is broken up. PNJ recognizes it is difficult to preserve large-scale industrial architecture like the Embankment. But a failure here will mean more than the loss of a landmark to Jersey City’s past and a source of scarce open space. The Embankment lies between two National Register historic districts whose integrity is threatened by the proposed development. Loss of this site will have a chilling effect on preservation efforts throughout the city.